In 2016 Intel retired their tick-tock development strategy in favour of the ‘Process-Architecture-Optimisation’ cycle, reflecting the increasing cost and development time required to shrink the manufacturing node. Skylake was the most recent architectural step, whilst Kaby Lake was Skylake’s optimisation. However Coffee Lake doesn’t represent a process node shrink (which isn’t expected until Cannonlake), so what’s going on? Simply put, Coffee Lake is a further optimisation of the Skylake architecture, but with one critical update: the addition of two cores in the monolithic die to bring the maximum in the package to six. Also, don’t mistake it for a repurposed Skylake-X die – whilst the Core i7-8700K has the same number of CPU cores as the i7-7800X, it doesn’t also support quad-channel memory; it does however include integrated graphics. With the exception of the two new cores and larger cache pool very little has changed under the hood in the transition from Kaby Lake to Coffee Lake. The I/O complex remains of a similar size, reflecting not substantial change in PCI-Express lanes in addition to continued dual- rather than quad-channel memory support. Both still support dual-channel DDR4 memory, 16 PCIe 3.0 lanes off the CPU, and DMI 3.0. 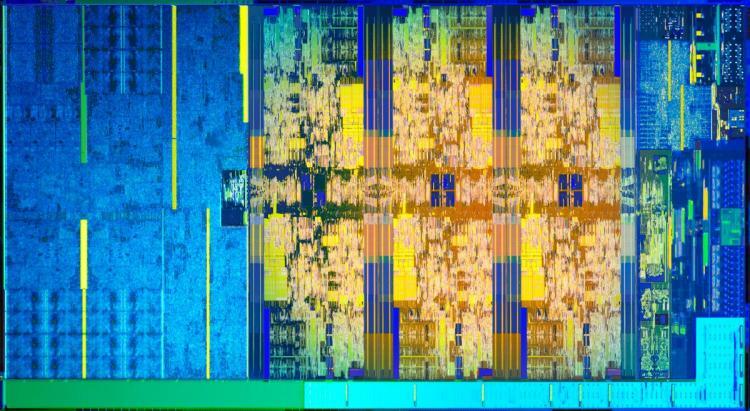 Most of the performance gap between the quad-core Kaby Lake and six-core Coffee Lake will be through the increased core count. The Coffee Lake i7-8700K additionally has an aggressive peak Turbo Mode of 4.7GHz, 200MHz higher than the i7-7700K, whilst a 3.7GHz base frequency when all six cores are operating is compares well with the 4.1GHz base of the quad-core design. These frequencies will be essentially meaningless if you engage in overclocking however. One unheralded feature of Coffee Lake is per-core overclocking. A necessary inclusion to make use of variable Turbo frequencies dependant on which and how many of the 6-cores are under load, it may have additional application in accelerating specific tasks that have been allocated to pre-assigned cores. Whether this feature is of interest to enthusiast overclockers however remains to be seen. Like AMD, Intel have begun marketing their PCI-Express lane provision in its entirety, listing Coffee Lake as supporting up to 40 PCI-E 3.0 lanes. Intel allocate 16 lanes off-CPU, primarily for GPU(s) and supporting up to 2-way multi-GPU configuration, and 24 lanes for the chipset. By contrast AMD Ryzen CPUs have 24 lanes in total: 4 for the PCH/Chipset, 16 for Graphics and 4 dedicated to NVMe M.2 Storage. Ryzen Threadripper of course has more, but is currently catering to a very different market. A more interesting comparison perhaps is with the Skylake X i7-7800X. Also a 6-core CPU with Hyperthreading, the 7800X supports up to 28-lanes off CPU, and as a result is better tailored to NVMe RAID, multi-GPU and other configurations which tax the available PCI-Express bandwidth. Your needs will therefore be critical in deciding between the mainstream flagship i7-8700K, or entry-level HEDT i7-7800X, rather than relying on standard CPU performance benchmarks which should be fairly similar. As with Kaby Lake and the Core X HEDT range, Coffee Lake supports Intel Optane Memory. A high performance caching system for mechanical hard drives, Optane Memory is the natural successor to Rapid Storage Technology (AKA Intel RST) and provides a decent performance boost at modest pricing. Intel Optane storage products have not yet set the consumer world on fire, and that is likely to remain the case unless consumer SSD substantially balloon in price or dip in performance. However it should be a consideration to those making a piecemeal upgrade to their system as the M.2 Optane Memory drives are themselves are relatively inexpensive. There is not much change in the graphical capabilities of Coffee Lake vs Kaby Lake. Once again Intel UHD 630 is the order of the day, but the maximum operating frequency for the 8700K SKU has apparently been improved slightly to 1.2GHz from 1.15 GHz. Coffee Lake also allows some frequency control on the iGPU, and the feature as ever is very useful for encoding and transcoding media. System configurations without a discrete GPU will be able to enjoy 4K HDR content, adding considerable value to the platform as a Home Theatre PC. Video output will typically depend on motherboard model.